Time Management Solutions is a provider of web-based time tracking and project management software for small to enterprise-wide corporations. With our web-based time tracking solutions, you simply connect to our services using the Internet. There is no software to install or configure, which means your company can be up and running immediately with no investment in hardware, software, or technical support staff. 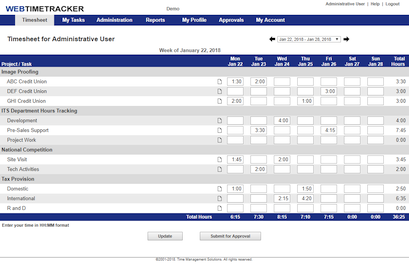 WebTimeTracker is a web-based timesheet application for project management and time tracking. Run real-time reports for time management, project tracking, project costing, and estimation analysis. 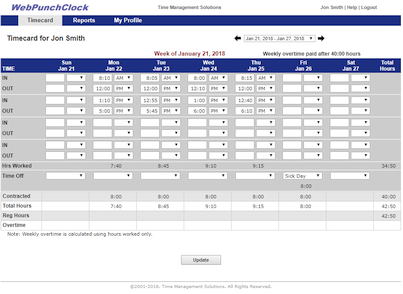 WebPunchClock is an easy to use web-based time and attendance application.